Karin Lewin’s painting and engravings speak the discreet language of the small objects of daily or familiar use: the brush, the pot, the stool, the table, a rag, first necessary elements of a furniture of fortune in a studio-room that becomes the emblem of her “psychic” room, emptied and re-appropriated, place of a virgin memory where a new experience that would stem from the nearest things, while recomposing atmospheres emptied of emotion, could resound freely and at length. Starting the painting anew like a medium to cross rather than one to use. It seems to me that Karin wants to express a kind of will/curiosity‚ a kind of recovery of her cognitive course, of a leading thread justifying life, taking a shy census of what surrounds her, the objects toward which or with which she wishes to establish a communication and an expressive projection in relation to a world, an outside reality, discerned as being faraway, difficult or foreign. Mysterious faces reappear from time to time, marginal in relation to the existential space of perception, their features marked and re - treated by the drawing, somehow increasing their consistency, the emergence of an ectoplasmic matter, in a way to erase its somatic evidence, as to repulse them in the shadow, among the present shadows laterally on both sides of the visual mirror. They are ghosts of the memory, of memories of actual experience, of counter - sections of the psyche. However, Karin Lewin’s emotional awareness, that, in a certain manner, evoke an intimate diary, emerge mainly from the small things, that are then like reassuring landmarks or measurements of space - on the existential level as well as on the psychic level - but also of the space itself, of the room, where tonalities interpret and tell the mood, the renewal of minute joys, elementary discoveries, or fragments of reality in partitions of an elevated inspiration, that allow flexible fluctuations : a kind of wreck in the silence of an emptiness - a big musical largo - felt not like a loss, an absence, an injury, but like a territory of sentimental rehabilitation, creative re fecundation and her own statute as a person, and therefore, as a painter, that “is to” intervene in the elaboration of the picture and in some repercussions of the reality of her conscience as pursuit for truth and efficient communication. It is the demonstration of a recommencement of life and art between the long ripened craft and automatic devices of the unconscious, between the instinctive spatial knowledge of the narration and the required certainty of a relation, of a “property” of the place and objects. The sign and the colour exist according to an abeyance that is not metaphysical, but the fruit of the simple listening of the voice of things separated from the context of the unceasing flux of events/energy of life and of the intricate and scheming woven of the reciprocal reports, relations and interrelations : a choice essentially pictorial in order to recover the truth of things and sensations/emotions; not the objective, alienating reality, nor the subjective, voluble and fleeting impression but this extremely variable point of tangency between two dimensions, there where the object projects its imprint in the conscience but lets itself also be remodelled and recreated by the feeling and by the art. To look at an engraving is to travel in a very secret country. Those of Karin Lewin don’t escape the rule. These shapes, these hatchings, these greys, these blacks and these whites come to us from very far away. With courage, persistence, the engraver went to deliver from under the copper or zinc plate, not knowing what is going to agree to be born, in spite of the intensity of the effort that creases her forehead and hardens the muscles of her hand... An approach precisely opposite to that of the photographer who operates by instinct. To the first eye sight. The engraving, itself, is cosa mentale. Its development is the outcome of a nocturnal fight, even though for hours the artist’s studio is dripping with light. To this consideration I remember the confidences of Jacques Villon, when, in his small house in Puteaux he had told me, a finger on his lips: “ Engraving is a long game of patience “. Beyond the perfection or even the scholarity of her technique, each engraving of Karin moves us, testifying a preserved innocence one would be afraid of, skimming the paper still fragrant of ink, provoking its erasing, like these dandelion flowers the least breath of wind can annihilate. Bending over the mirror of your engravings, thank you Karin to have allowed myself to scrutinise inside you, guessing who you are better than in ten or twelve years of loving friendship. We know ourselves not enough, how can we know truly what hides behind appearances, but, travelling through the labyrinth of your pictures, I discovered a sensitivity of dawn, a light of early morning, the very same light I’m watching for over the mountain of my small island, Ios, knowing that life will spring out once again. Thank you Karin, for giving me in Paris, and thanks to your meticulous work, this return of the eternal spring. Thank you for having, in your engravings, succeeded in the seizing this so rare moment. 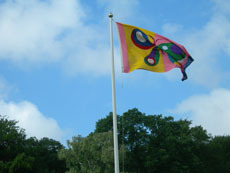 Recently, a flag is floating above my garden in Chatou! Thanks to Karin…but of course, in order to see the “Cosmic Butterfly” and the multicolored figurehead, there must first be some wind, more than just a breeze -- a lot is better! Above all, I’d say that it protects me, like most of the paintings that surround me, emanating from the four corners of the world that little by little have invaded my house. In this respect, Karin’s “Cosmic Butterfly”, does not escape this mysterious rule without which Art is not, and in my eyes, but a derisory object, good to be thrown away in a dustbin. Yes, every time it decides to unfold it’s wings, Karin’s “Cosmic Butterfly” makes me feel joyful, especially lighter, as if I too were to fly away and join my dear Cyclades Islands. Just another word in confidence, but don’t tell anyone -- strangely enough, Karin’s flag gives the house, the garden, even the flowers, a kind of identity, obvious yet secret. It’s as if the “Cosmic Butterfly” wrote in the sky that without art and therefore without artists worthy this great name, our lives would be, empty without perfume, grey, and without music. Let the “Cosmic Butterflies” multiply infinitely in the sky to help us overcome our anxieties and cover us with beauty and joy, night and day. Forever! In Karin Lewin’s studio, there is little distance between the finished painting and the object she has portrayed. Subjects surround her where you find Karin’s brushes and other tools. There’s her sketchbook and shoes lie nearby. It’s a world made out of well-known objects that speak a surprising and secret language. Karin knew early on that she wanted to become an artist. In spite of her parents misgivings but confident of her ability, Karin left immediately after obtaining her high school diploma 1968 to live and study in Paris. It was like “jumping from the frying pan into the fire”, as she arrived in Paris during the infamous May student uprising of the same year. The university was closed and riots and teargas were everyday events. Gradually, as the situation calmed down, Karin began studying French at the Alliance Française because a French language diploma was required to enter the Beaux-Arts. At the same time, she made sketches of live models at La Grande Chaumière. A year later, she entered the Beaux-Art’s painting department and a whole new world opened up to her. For many years Karin studied painting, lithography and engraving. From a fairly carefree life as a student she finally progressed to become a professional painter. She spent a lot of time in Provence but ended her frequent stays there, with an exhibition at Galerie Points de Vues in Arles in 1998. After waiting for almost twenty years, she finally got a small painter’s studio in Paris that has now become her permanent residence. To reach the studio, Karin walks down eight flight of stairs, crosses the entrance hall of the building, then walks up another eight long flight of stairs and to reach her atelier, situated at the same level as her living place but located in the opposite staircase. Yes, there is a lift, but climbing the stairs is Karin’s way of getting some additional exercise. Together, we take the lift to her studio. When Karin opened all the locks, some of which were added together with a peephole after an attempted break-in. Her studio is small and well organized - everything is in its place. Yes, there is order and a state of readiness, there is also at the same time a feeling of exhilaration over it all. Here, there are playful images of things that surround her stacking up! One series is called ‘The Tools of the Artist’, another shows ‘The Clothes of the Artist’, and a third ‘The Ties of the Artist’. Some others are titled; ‘The Presents of the Artist’ and ‘The Jewels of the Artist’. “Early on, I painted a lot using nature as a departing reference, and I used more traditional means of expression than what I do today. With time, my paintings have become more personal and today my inspiration derives mostly from my inner thoughts. Sometimes I can look at things that I’ve been using for years and it strikes me that now I see them differently”. Objects surrounding Karin in her everyday life are translated in a seemingly simple way. The lines appear to be easily drawn but only a person who knows exactly what way the pencil should take across the white paper could have done them. Sometimes the images seem almost naive, with objects placed in the middle of the picture with a colorful background. Grass green drowns out turquoise, rose shocks black till it resigns and yellow shouts the loudest! Karin makes use of several different techniques. For many years she has worked with a French printer who produces her work in small editions. “I can only do oil paintings with daylight, however, I can use other technics at any time”. Karin works extensively on each theme seldom knowing from the start how long each theme will require. One thing leads to another. In 2010, she exhibited her ‘Tools of the Artist’ series of silkscreen prints, which were hung on a line like laundry at the Galerie aux Quatre Vents. Later her work evolved to creating colorful flags and pennants. “I want to create something for everyone and not just artwork you have to buy to see and appreciate. 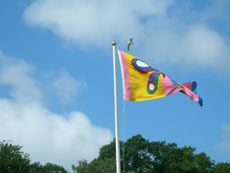 I always liked artwork that was detached from walls, such as the flying of flags and pennants or freestanding screens. As a child on my birthday, a flag was always raised and that was a big event for me.” There is a long way from the sketch to the actual sewn flag. The flags are sewn with the same technic that has been used ages, a thick zigzag seem and with a reversed backside. This technic is falling out of use but at the flag factory National in Gothenburg, the ‘know how’ is still alive. There, her sketches are sewn up with the same fabric and measurements as the Swedish flag (150 x 250 cm), but here all resemblances end. Karin is searching for maximum color contrast and tries constantly new color combinations in her sketches before the flags are made. 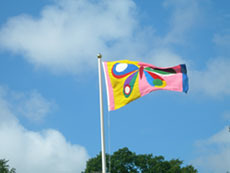 The flags sell one by one like graphic works in a numbered edition or they are raised in significant numbers as a monumental and mobile art exhibition in public places. When looking back upon Karin Lewin’s artistic work you get the impression that she has lived many different lives. In her Art, Karin has explored a number of worlds. She has tried and selected, step by step, eliminating the superfluous and concentrated on the essential. Her inner necessity to simplify life and accordingly her artistic expression has brought her to closely observe her immediate surroundings near objects and their innermost spirit. The tools and instruments of the artist that she has immortalized on the canvas have raised their signification to greater emblems. Accordingly, she conjures existence and makes it hers. The simplicity of form in Karin’s imagery fill every line and color in tune with their signification and independent life. See, hear and feel the sound of colors! Now is the time where emblems seek freedom. Like butterflies, they flutter and find their temporary position on pennants and flags that flow freely in the wind and bask in the sunlight! What a concentration of Liberty and Delight! and Cultural Adviser to the Swedish Embassy in Paris.